The Drive for "Plain English"
Over the last hundred years or so Saxonism as a nationalistic movement for the return to the pristine purity of the native tongue has been transformed into the drive for “Plain English”. The cry for “Saxon English” now usually means nothing more than a demand for plain and unaffected diction, and a condemnation of the idle taste for “words of learned length and thundering sound”. From the end of the nineteenth century such demands have come to represent significant linguistic reflexes of democratisation of the British society and have become part of a general movement away from old class constraints and social rigidities. The lexicographer Henry Watson Fowler was one of the first writers to realise the importance of a full treatment of common and everyday words. 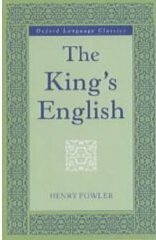 Helped by his younger brother Francis George, he produced two very popular books, The King’s English (1906) and A Dictionary of Modern English Usage (1926). The latter remains to this day a respected popular authority on grammar, vocabulary, usage, and style. Prefer the Saxon word to the Romance. In particular, the Fowler brothers underscore the last rule as a sort of compendium of all the others, observing that “the writer whose percentage of Saxon words is high will generally be found to have fewer words that are out of the way, long, or abstract, and fewer periphrases, than another; and conversely”. They emphasise that this principle must be applied intelligently: what is suitable for one sort of composition may be unsuitable for another. One of the main dividing lines is that between formal and informal registers, or to use the Fowler brothers’ terms, between “the dignified and the familiar.” However, their emphasis on simplicity as the true ideal could not but modify the views about the choice of words for “dignified” styles. There has been a rather widespread reaction against the remoter aspects of formality and the sense of rigid appropriacy. We have come to insist that the different styles of language (or dress) required for different occasions and purposes are neither immutable nor even absolutely obligatory. To Borrow or Not to Borrow? The Quest for "English English"
Have you ever wanted to use meaningless, empty phrases that make it look like you know what you are talking about? Simply click on the button below this paragraph and a random piece of business jargon will appear in the box. If you need more than one buzzphrase, just click the button again and again.